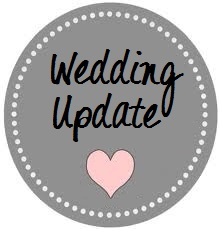 It’s been far too long since my first wedding update, so let me get everyone caught up! As you can see I’ve made some progress! I said yes to the dress! 🙂 We booked our photographer (yes, the one I wanted from before) and had our engagement pictures taken. I have the bridesmaids dresses narrowed down to a few choices. We also have invitation and cake ideas narrowed down just need to put them together to make the perfect one. As for the cake I want a smaller cake with cupcakes. I know how I want my bouquet, just don’t have anything booked yet. We have a good idea what our reception menu will be, just need to make final choices, but we have some time for that. The guest list is basically done, just need to review and add on the finishing touches. Still checking out table decor for the reception, we have a good idea of what we want just still keeping our eyes open. I was lucky and my dress needs minimal alterations, score! Paper & Twine Liquid Chalkers. I am very excited to try out Paper & Twine’s Liquid Chalkers. With my upcoming wedding (July 25th) coming faster than I think, this will be perfect for some wedding DIY products. I have not yet had a chance to use them, but I can’t wait until my DIY stuff is ready! I heard such great things about this brand. I have the 4-pack of white chalkers, but they also have a 4 and 8 pack of colored chalkers – how awesome! They are available for purchase from Amazon or their website. Stay tuned to see what DIY projects I have came up with for our wedding! Disclaimer: I received a pack of liquid chalkers for review. All opinions are 100% my own. 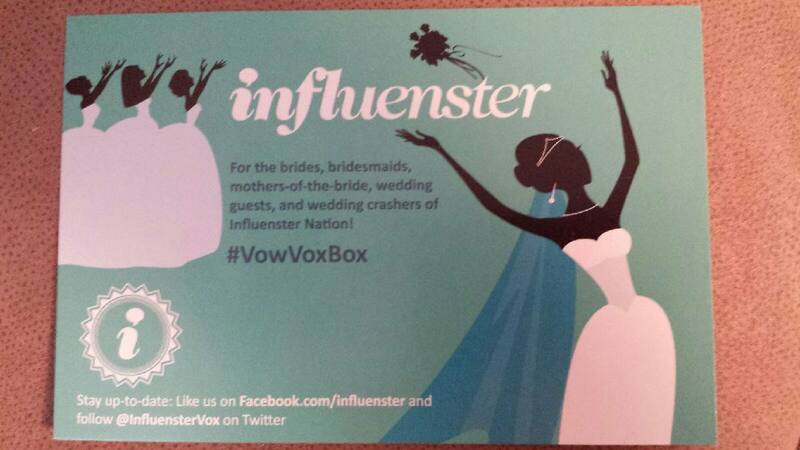 When I was accepted to receive Influenster’s Vow VoxBox I was BEYOND excited. Obviously, I couldn’t wait to see what was included in the box because I’m getting married next year. I impatiently waited for the box to arrive, and when it got here I ripped into it, and it contained some pretty great products! Sally Hansen Complete Salon Manicure in Barracuda. A light blue color. I absolutely love the Complete Salon Manicure line from Sally Hanson. It has a really unique brush that evenly applies the polish. It has great coverage and long wear-ability. Olay Regenerist Luminous Tone Perfecting Cream. I was pretty surprised to see this in the box since it retails for over $30. I actually saw the commercial for this product a few days before receiving the box and thought it’d seemed neat and that I’d like to try it. Well they read my mind. It moisturizes nicely and leaves skin looking smooth and even. Good product but I don’t know if it’s a miracle product, but it’s not bad. Riley & Grey. A wedding website company. This card included a discount. I checked out the website it has nice websites and great themes. But this just wasn’t for me, not with plenty of options for free wedding websites. This just wasn’t an expense I could afford splurging on for wedding planning. Pure Silk Moisturizing Shave Cream in Raspberry Mist. A brand that’s been around forever. An oldie but goodie. This cream smells good, applies nicely, and leaves legs moisturized and smooth. 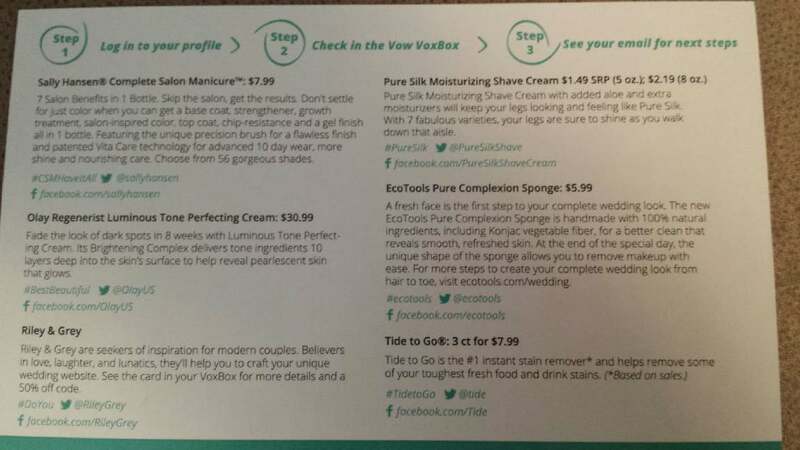 EcoTools Pure Complexion Sponge. I’m not going to lie, I have never seen anything like this before in my life. When dry it feels like styrofoam but when it gets wet it turn soft. It’s supposed to be really good for your skin and exfoliating. I have yet to try it. Tide to Go Pen. Another oldie but goodie. Just rub the pen over the stain on your outfit and wah-lah it dissolves (most of the time). I always have one in the car, so I put this one in my work bag. Just product to have on-hand because you just never know. Overall I was impressed with all the products in this box. It was a really great collection. 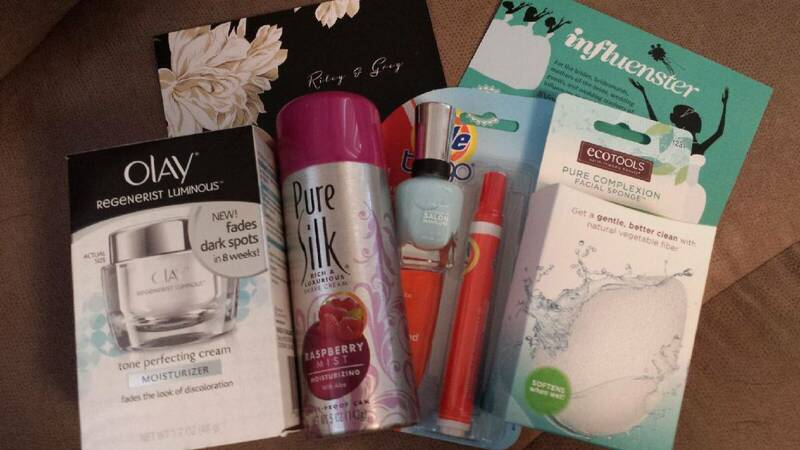 And I hope I have the opportunity to review and try out another one of their boxes. Disclaimer: I received these products to review. All opinion are 100% my own. Ceremony Location. St. Matthew’s Lutheran Church. Reception Location. The Center Inn. Colors. Blush & mint (with gray). Theme. Romantic, country, best day ever, causal, fun. In the next couple of weeks we’re going to meet with a potential photographer. I really love her work AND she seems to have one of the better deals. I’m pretty sure this is who I want to go with but I am SO nervous about committing (hahaha). Mainly because the photography is really important to me, and I just want to make the right choice. I feel like I should meet with some other photographers, but I’ve compared places online and keep going back to the same one, not even wanting to meet with any others so I don’t know. Decisions, decisions. Did you meet with several photographers, or did you know who you wanted right away? As far as the wedding party, we pretty much have our bridesmaids/groomsmen picked but haven’t asked anyone yet. Still a couple of small decisions to make. We have ideas for ushers, hosts, guest book attendants, flower girls, ring bearer, etc. but need to buckle down and get that sorted out pretty soon also. We also need to look into caterers. There aren’t a whole lot around, so there’s less to choose from. Meaning we should book sooner so we can get who we want. I’ve been researching and ordering a ton of (free) invitation samples. I don’t really have a specific design in mind. I know it’s pretty far out for invitations but not as far for save the dates and I’d like to have a general idea of what I want because that will help with other design elements. I’m totally undecided with table decor, not really a big deal right now. I’m just pinteresting to find things I like. I’m way to type A and OCD not to. And I know I pretty much sound like a crazy person saying I, I, I and you probably want to smack me and tell me it’s not all about me. But don’t worry, I know that! Kyle just doesn’t really care what we do, he tells me we aren’t having engagement pictures and he’s wearing jeans! It’s OK because I still include him on all decision-making. I finally talked him into meeting with said photographer (who is 1.5 hours away) by saying we could go to the farm toy museum (located in the same town). It’s all about compromising people. We planned our wedding around a tractor pull. I thought June 27, 2015 sounded like a good date for our wedding. So we checked calendars, etc. for events that weekend. Then we realized that the Budweiser Dairyland Super National Pull in Tomah, WI was scheduled. Well change of plans! We wanted to make sure some people would attend our wedding since a good portion of our guest list attend the pull. 😉 So yes, we planned our wedding around a tractor pull. But I am happy to announce we have picked a date! 07.25.2015. Oh man we don’t even have a date set and I’m having Wedding Dilemma #1! And the date is not even the dilemma. I found John Deere tractor cufflinks. I know I’m going to buy them for Kyle and keep them a surprise. I wouldn’t be buying them so soon but the sale ends soon and I don’t know if I’ll be able to find them closer to the wedding. OK, so here’s my problem: Originally, I was just going to get them for Kyle so his stood out. But then I thought about how all the groomsmen are as much into tractors as he is, so maybe I should get them for Kyle & the groomsmen. But them my mom said well maybe you should get them for Kyle and the groomsmen plus Kyle’s dad and our grandpas (who are equally obsessed with tractors as everyone else). My grandpa will be walking me down the aisle, if that makes a difference. I’m pretty sure I just think too much. I don’t have very much experience with weddings in general, so we’re going to need to start a ‘Lipstick & Tractors Wedding Support Group’ for me :). So I would love to hear your guy’s opinions! Who do you think should get the tractor cuff links? Would it be weird if all the guys had them? I’m no wedding expert, first time doing this y’all, but I have some tips for when you attend wedding shows. Besides having the patience to deal with possible bridezillas and overly pushy salespeople, I suggest preprinted address labels and a separate email for all wedding planning business. Preprinted Address Labels. At wedding shows you will visit booth after booth of vendors wanting the same information. Meaning you will have to fill out those same information cards time after time. I don’t know about you but I don’t want carpal tunnel from filling out vendor cards! Cue my solution…preprinted address labels! 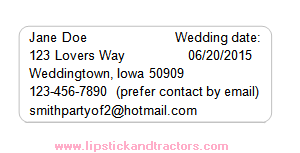 Include your name, address, phone number, email address, and wedding date. This way you just have to slap a sticker on the card, drop it in the box, bowl, whatever, grab the information from the booth, and be on your merry way. I used Avery Address labels (#8160) they are 1 x 2-5/8” in size, you can download a template from the Avery website to easily type in your info and print. *After my phone number I put a note ‘prefer contact by email’. I’d rather sort through the vendors in my email to find the ones I’m most interested in, then initiated phone contact rather than receiving 159 phone calls in the week following the show. PS: I used these at a wedding show on Sunday and they we’re a HIT! I got a lot of compliments and a lot of girls told me they wish they would have thought of printing some off. I saved a bunch of time not filling out all those cards! 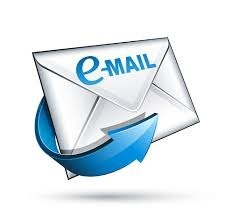 Separate Email Address. I hate having a full inbox. I hate sorting emails. I hate junk mail. For this reason I created a separate email for all wedding related business. I use this when ordering catalogs, signing up for newsletters, logging into websites, etc. It keeps all the wedding stuff together while not filling up my ‘everyday’ email address. I had some fun with this email and made it something wedding related! leistikowpartyof2@hotmail.com. Clever right! ?